The police have cleared hundreds of protesters from a site in Nilakkal and said no protesters would be allowed to gather near the Sabarimala temple. Nilakkal/Pamba: Kerala's Sabarimala temple opened its doors to women of all ages on Wednesday evening after much protest, violence and the final imposition of prohibitory orders that bans large gatherings. Through the day, protesters had been trying to enforce the centuries-old ban on the entry of women of reproductive age in the temple, which was scrapped by the Supreme Court last month. They combed buses, stopped women from going near the temple, attacked journalists, vandalised media vehicles and threw stones at the police. Kerala's CPM-led government has blamed the Rashtriya Swayamsevak Sangh, the BJP's ideological mentor, for the violence. Kerala minister EP Jayarajan said 10 state transport buses have been damaged and devotees from other states were beaten up and sent back. "RSS criminals hid in forests and attacked the Ayyappa devotees. Ten media personnel, 5 devotees and 15 policemen were attacked," Mr Jayarajan said. Protesters demanding that women aged between 10 and 50 years be kept out of the shrine, threw stones at the police, who chased after them through the forests with batons. 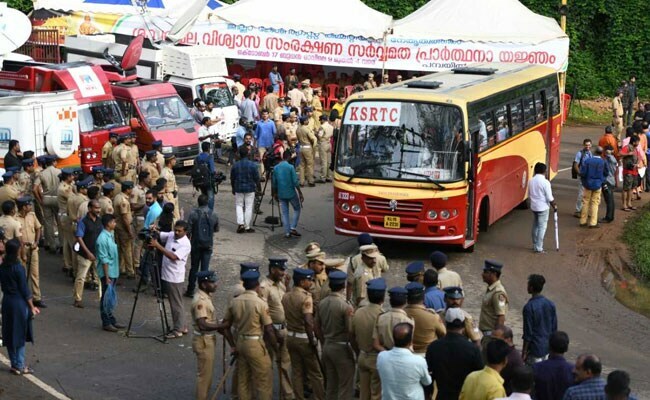 Despite the heavy police presence along the route, the protesters screened buses and women were pushed, manhandled and violently turned away from Nilakkal. Two reporters -- one from The News Minute and one from the Republic TV -- were attacked by mobs while covering the protests near Sabarimala. Republic TV said its reporter Pooja Prasanna was surrounded by a 100-strong mob. Saritha S Balan of The News Minute was "kicked on her spine" by a protestor, the website said. NDTV reporter Sneha Mary Koshy and cameraperson SP Babu were stopped from covering the protests midway. Their camera was snatched and they were asked to leave. The crew from CNN-News 18 and Aaj Tak was also attacked. At Nilakkal, the base from where the trek to the hilltop shrine begins, the police lathicharged the protesters in the evening. Fifty protesters -- including former Travancore Devaswom Board president Prayar Gopalakrishnan -- were taken into custody. No protesters are being allowed to gather near the temple and prohibitory orders banning large gatherings was declared around Sabarimala. Seven people were arrested -- three were in connection with an assault on a woman and her husband from Tamil Nadu. Activist Rahul Easwar was arrested and a First Information Report has been filed against him under non-bailable sections. Apologising for the attack on journalists, Rahul Easwar said, "I didn't hit any woman... I was moving to the other direction. It's a vendetta against me". On Tuesday, devotees pulled over traffic to check for women of menstrual age, forcing a group of female journalism students off a government-run bus. Women have been banned from the Sabarimala shrine for hundreds of years as devotees believe menstruating women are "impure" and the temple's presiding deity, Ayyappa, is celibate. Many take a vow of celibacy for 41 days before beginning a trek through the mountains to the temple. Kerala Chief Minister Pinarayi Vijayan has said his government will not give in to attempts to prevent women from entering the temple and police will help uphold the Supreme Court order. The BJP and the Congress have demanded a review of the court order.